In Matthew Chapter Fifteen, we read about a Canaanite woman, desperately troubled over her daughter who was possessed by a demon. She approached Jesus, crying out to Him for help, but His response was not what we would have expected. At least four times during her encounter with Jesus, this woman could have easily chosen to take offence, and walk away from her miracle. Instead, each time she chose to not be moved, and persisted in faith. It's quite a story! At first, Jesus remained silent and appeared to ignore the woman entirely. Which only made her cry out louder. This got the disciples mad, and they rejected her, insisting she be sent away. Then Jesus made it clear that He was only sent to the lost sheep of Israel, implying that since she was a Gentile, not a Jew, she would be excluded from receiving His ministry. Then, to top it all off, Jesus plays on a Jewish saying, likening Gentiles to dogs! Now, what would you do in that situation? What do we do when we have a desperate need, but Jesus seems silent? What do we do when we feel rejected or offended by those in the church? What do we do when we feel excluded? What did this woman do? She remained focused and was steered by her faith, not by the silence, rejection, exclusion or hurtful words. She persisted and responded in faith to each retort. 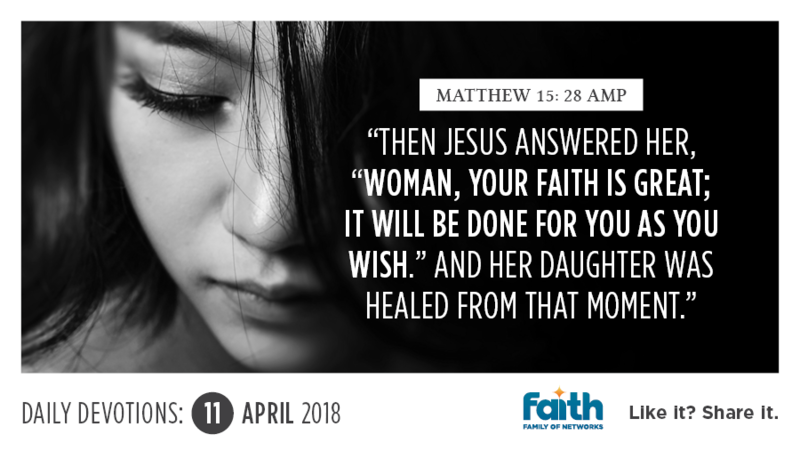 As a result, Jesus turned to her and said, "O woman, great is your faith! Be it done for you as you wish. And her daughter was cured from that moment". Jesus always responds to our faith. When we choose to not be offended, but persistently hold onto our faith, we will walk in God's blessing. Today, choose to not take offence, choose faith, and walk in His blessing!